Stress can cause work injuries. Many people ignore how stress causes accidents in the workplace, which can put them at a high risk for serious injuries. Understanding how workplace stress affects your safety can motivate you to reduce your stress levels while on the job. You could drop a heavy object on yourself. You might slip causing a machine part to cut you or injure you. 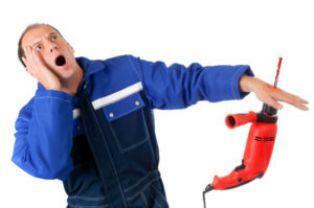 You may forget to turn something off or reenact a safety feature which could injure you or a coworker. You have a big project due tomorrow that you haven't started. You go into the file cabinet and grab more files than you can carry, which means you have to muster all your strength to lift them. You forget to lift with your legs and you injure your back. You are late for a meeting again but you need to grab a file off a coworker's desk on the other side of the building. You briskly walk -- or run --to that work area, paying no attention to where you are going, and slip on spilled water and break your leg. You are overwhelmed with work and have papers, files and books all over your desk and floor. You have even started placing stacks of books and file boxes outside of your work area for easy accessibility. One day you decided to leave a stack of books in a high traffic area (just for a minute), someone walks by, trips on it and breaks an arm. You're late for a meeting with your boss. You rush to the break room to pour a cup of coffee for you and her, as you rapidly walk to your boss's office, someone walks in front of you, you stumble and spill hot coffee all over the person, burning your coworker. While driving, you look at a spreadsheet on your laptop and talk on your cell phone to your boss. You don't realize the car in front of you has slowed down and you rear-end it. You are in a rush to get to a meeting, run a red light and t-bone a vehicle crossing the intersection. You're thinking about all the deliveries you need to make before 3 p.m. and don't see a car pull out in front of you. You didn't have time for lunch, so you eat in the car on your way to a delivery or meeting, something spills on your lap, you look down and drive into a guard rail. No matter what type of work setting, it's important to pay attention to your stress levels so you are able to implement workplace safety. Many times, the reason why stress causes accidents in the workplace is because it causes people become inattentive to their surroundings. Being aware of your stress, and how it affects your work safety can help you avoid accidents and injuries.